other practices to ensure you maximise your productivity and profitability – and, most importantly, maintain a competitive edge. It can also be an excellent tool for tracking practice strategy, planning and business development. The best indicators of a successful practice, therefore, need to reflect these four outcomes – financial performance, client quality, team performance and clinical care – which provide a balanced scorecard of cash, cases, clients and culture. Key performance measures. What do we actually measure in each of these domains to know if we are achieving our goals? Depending on our strategy and stage of business, these may change. In most cases, a “critical few” measures exist for most practices, and a range of variable measures we can use, depending on your current goals. the natural tension between these outcomes, such as the “pet versus profit” paradox. 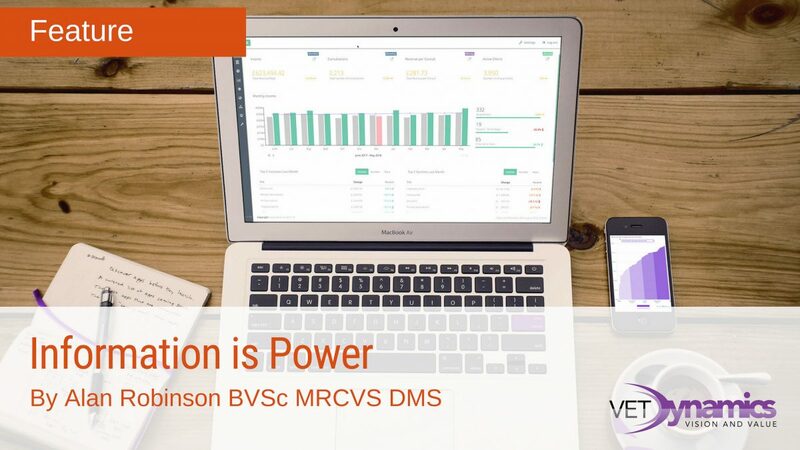 Your “data dashboard” should provide your practice, branches and individual vets with quantifiable individual benchmarks of their financial, marketing, clinical and team performance during the previous 12 to 24 months, and also compare them with the averages and upper and lower quartiles of other well-performing participating practices. Lag measures. These tell you what you have achieved after the event, are useful for trends over time, and quantify results, goals and outcomes. Lag measures are easy to measure and generally accurate – therefore, the most readily available. They are essential for charting progress, but useless when attempting to influence the future. Lead measures. These tell you how you are achieving your lag measures, define processes, and qualify action and behaviour. They are both predictive, meaning they lead to the accomplishment of the lag measure or goal, and are influenceable, meaning you can do something about them. Lead measures are about narrowing your focus down to the two or three things that “trigger” success, or your end goal, such as vaccination rates, health care initiatives, dental compliance, consultation and diagnostic ratios. It is always good practice to have access to a combination of lead and lag indicators. The reason for this is obvious; a lag indicator without a lead indicator will give no indication as to how a result will be achieved and provide no early warnings about tracking towards a strategic goal. A combination of lead and lag indicators, and regular business coaching, result in enhanced business performance overall. appallingly low in practice – most clients with vaccinated animals only worm once a year and only use flea control when they see a flea. Your vets will vary greatly in how they promote your services. Seek out those that do it best and find out what they do.One way to measure PHC compliance is to measure the ratio of products and services that are generated as a result of having a vaccination. Typically, every primary kitten or puppy vaccination should produce a year’s flea and worm product sales, a microchip, a six-month health assessment, a neutering operation (in most), and some level of food sales and a booster vaccination in 12 months. 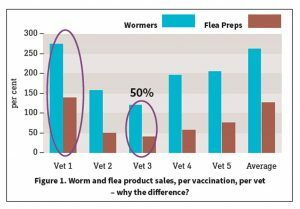 Every booster vaccination should produce a year’s flea and worm product sales, a six-month health assessment, dental care (in most), and some level of food sales and a booster vaccination in 12 months. All this should be monitored as a ratio against the number of primary or booster vaccines sold – decide on your target ratios and create protocols to achieve them (Figure 1). Most vets work far too hard, for far too many hours, for far too little return. The principal cause of this is vets’ failure to charge profitably for their professional time. Often, they don’t know what their professional time is worth, except in terms of the consultation or the surgical fee, and these are often determined by what other practices charge rather than based on the needs of the practice finances and profitability. serious financial, clinical, and customer service implications on the practice and staff. value and increasing profit in any veterinary practice. Price products and services profitably, and agree they are fair. Measure average consultation fee – the critical determinant of practice revenue and profit. Invoice correctly. Just charge for what we actually do. Measure income per consultation – a measure of vet recommendation and client compliance. Laboratory work, radiology, endoscopy and ultrasounds are all areas that add value to the diagnostic process. 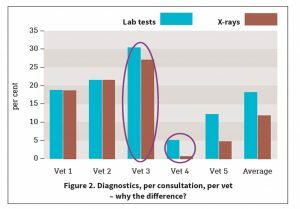 Measure the number of diagnostic procedures carried out per vet as a ratio of consultations. How many blood tests/x-rays per consultation? You will usually see great variation between vets and their potential to generate extra income. Obviously, we are talking about professional and ethical practice to improve the diagnosis and prognostic rate for the client. These figures should be measured on a per vet basis, as well as for the practice. 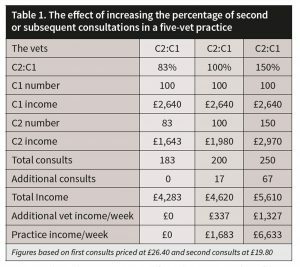 Any difference in performance needs to be discussed between the vets and a suitable protocol developed to optimise patient care and clinical performance (Figure 2). 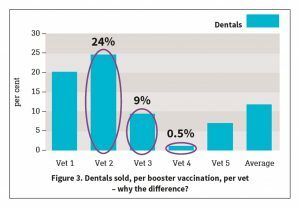 Our UK benchmarking reports (Vet Dynamics Index) tell us only about five per cent of pets receive routine prophylactic dental care. Research has suggested 60 per cent to 70 per cent of the animals examined in practice need some sort of prophylactic dental treatment or dental surgery. Unfortunately, many are left far too long before they are treated. Dental disease in dogs and cats is a serious clinical (and welfare) condition, causing pain, bacteraemia and organ damage if left untreated. fall out is a serious dereliction of our professional duty. Vets need to focus on dental treatment and catch them early. Use nurses to educate clients about dental care, and carry out routine scale and polish procedures to lower the cost base for the client to encourage compliance in younger animals (Figure 3). Do you send your clients off with a vague reminder to “come back in three weeks” or to telephone “if Barney seems worse”? How many times have you told your client the following? > “If Fido isn’t better in five days, telephone me”. > “Let me know how Fluffy is when she finishes her medicine”. > “If that lump starts to grow, bring Sparky back in”. What we don’t realise is, when we use these phrases, we are doing our patients and clients a grave injustice. How? By making the client the vet and, therefore, delegating to him or her our responsibility for evaluating the pet’s health. The results can, at the very least, cost you the client’s trust. most practices, the repeat consultation rate (number of subsequent consultations to primary consultations) is often less than 50 per cent. The reality is, it could easily be 150 per cent to 175 per cent by practising improved compliance protocols, and practising better medicine and better patient care. All this generates extra revenue from the same number of clients. Our recommendation is a C2:C1 > 100 per cent. Increasing the C2:C1 ratio improves compliance, clinical care and profitability (Table 1). numbers” identifying “where they can do better”; focus on the most significant, important or profitable factors; and set realistic goals against which their progress can be measured. It also helps minimise complacency by challenging the acceptability of current performance. Practices that become complacent with their performance tend not to make the necessary changes to maintain and improve it in a more challenging commercial environment. conclusively shown us practices that set goals, benchmark and measure performance do better financially and qualitatively in all areas of practice performance. 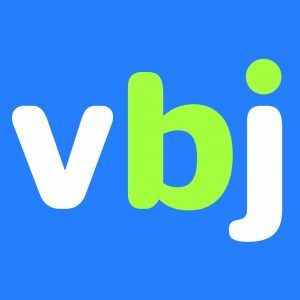 Special thanks to VBJ – pages 12-14 in their March 2019 edition.